928-282-1916 or order directly online! Welcome to American Truck n' Auto Accessories where Quality is our motto. Quality parts along with quality service is the way we do business. We specialize in Custom Billet Grilles, Chrome Trim, Interior and Exterior appearance accessories for your car, truck or SUV. 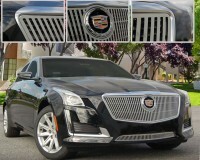 1007-010U-14VO: 2014 Cadillac CTS (Sedan). (All models except V-Sport). Not Adaptive Cruise. Classic Vertical Custom Grille Overlay. This custom grille is machined from high quality steel and is finished in triple layer chrome plating. Bolts directly onto the OEM factory grille. Lower grille is also available above as optional item and bolts directly into the bumper opening. Installation can be done with regular home tools in about 1hr. Copy of installation instructions are available below. Comes complete with installation instructions and hardware. Backed by manufacturers 3yr warranty. Made in USA. Tell your friends about the Classic Chrome Vertical Style Custom Grille Overlay. Share this product on Facebook, Twitter, MySpace or send an email to a friend! 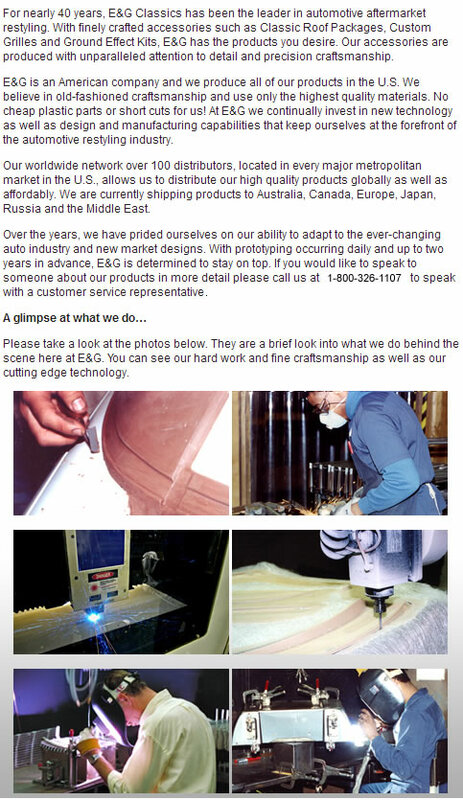 We have many manufacturers and warehouses throughout the US. To minimize shipping time, we will send your order from the nearest warehouse to you that has your product in stock. Normal delivery time is between 2-6 business days. How will I know my order has shipped? If you supplied us with an email address when you placed your order, we will send you an email when your order ships. We ship via UPS and FedEx and if you provided us with an email address when your order was placed, we will email you the tracking number which will tell you where your package is, and when it is expected to be delivered to you. My order arrived damaged, what do I do? If you notice the box is obviously damaged you can accept the package and instruct the driver to make a note of the damage. Many times the contents is not damaged even though the carton is. Or, if the carton is badly damaged or crushed and there is a great possibility that the contents is damaged, you can simply reject the package and tell the driver you wish to file a damage claim. If this is the case, please let us know so we can co-ordinate a remedy and get another product out to you asap. How will I know when my back order ships? If you have a product on back order and you supplied us with an email address, we will send you an email notifying you that the back ordered product has shipped. I didn't get what I ordered, what do I do? If for some reason you receive a product that you believe is incorrect or not what you ordered, please contact us asap via telephone or email. If you wish to change your order, please let us know asap. If your order has not shipped, then it should be relatively easy to change your order. If the order has shipped and you wish to change the order, you will need to go through the return process. Please let us know as soon as possible so we can co-ordinate the changes and make things as easy as possible for you. If you wish to cancel your order, please call or email us as soon as possible. If the order has not shipped, it can be cancelled with no problem. If it has shipped, you will need to wait until it is delivered to you and then go through the return process which can be found under the Returns link on our web page. Can I change the delivery address of my order? If you wish to change the delivery address of your order, please let us know as soon as possible. If the order has not shipped, it is easily possible to change the address. If it has shipped, it still may be possible to change the delivery address. Either way, please contact us asap so we can try to accommodate your request. Where can I see your company Policies? If your product has a defect that you believe may be due to a manufacturers defect and is within the warranty period offered by the manufacturer, please either call us or email us and we would be happy to communicate with the manufacturer on your behalf. I experienced a problem with your website. How do I let you know? Please email or call us if you experience a problem with our website. You can use the Contact Us links on our site or call us at 1-478-216-5689 or email customerservice@billet-grilles.com. Thank you. Is your site secure and is my personal information safe? Yes. We utilize 128bit secure encryption by Verisign when any sensitive data is transmitted or received by our website. Our website and server are scanned regularly by both Verisign and Trust Guard for vulnerabilities and malware. We strictly adhere to the PCI (Payment Card Industry) codes and standards and all information about our security procedures is checked and verified. Click on any of our security seals to verify. You will only be charged sales tax if you reside in the state of Idaho. How do i obtain an invoice or copy of my credit card charge? When an order is placed over our website and you provide us with a valid email address, you will be automatically emailed an order confirmation from us and a copy of your payment confirmation from the payment vendor you used. For example if you used a credit card, your credit card company will send you a copy of your payment. If you used PayPal or Google Wallet, they will also do the same. Alternately, if you placed your order online, login to your account using the same username and password and click on the My Account link near the top of the page. You will see your order there. Click on the button on the right that says "View". Click on the button that says [Print Order Invoice]. How does your price match work? I would like to comment on the product or service i received. How do i do this? Copyright © American Truck N' Auto Accessories.